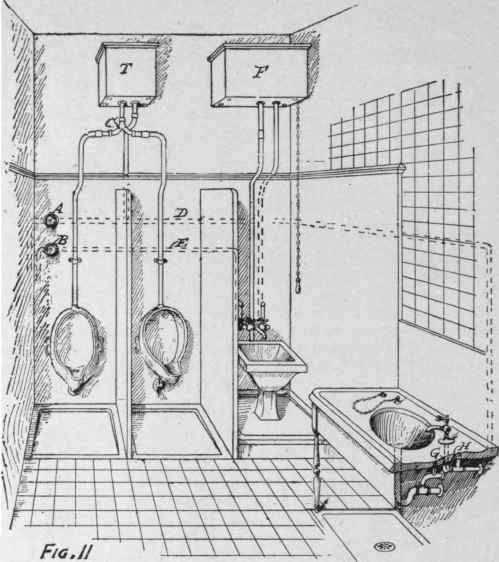 This section is from the book "American Plumbing Practice", by The Engineering Record. Also available from Amazon: Plumbing: A working manual of American plumbing practice. 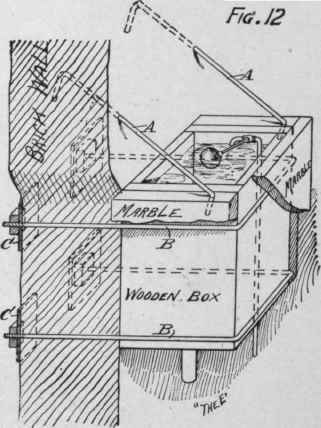 Figure 5 is a sketch of the roof tank A that is about 6x12 feet and 7 feet deep, built of 5/16 inch iron, with 2½ x 2½ - inch corner angles and stiffening bars of 4x4 T iron and 2x3 angles. It rests on 5x6-inch yellow pine sticks B B, that raise it from the iron safe C that is provided, notwithstanding that it is above the iron roof surface D, from which all water drains directly to the gutters. E is the 4-inch fire line. F is the 2 inch house supply. 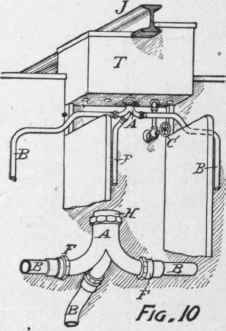 G is the 4 inch overflow that discharges directly on the roof, and has a 10-inch copper flaring top H, intended to increase the rapidity of discharge. I is a 2-inch sediment pipe emptying the tank. It also discharges on the roof. J is a 2-inch pump pipe, and K is a 1-inch relief pipe from the boiler C, Fig. 2. L is a 2-inch safe waste discharging in the sink, Fig. 4. 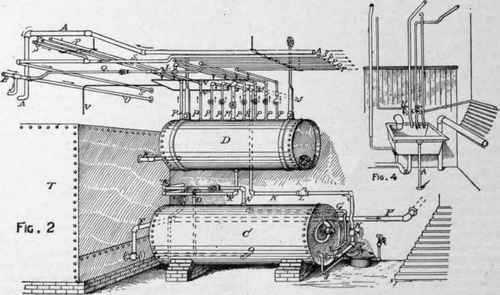 M is an 18-inch copper float operating the gauge index in the engine-room. This building contains about 40 water-closets, 20 urinals, 50 washbowls, and six slopsinks, exclusive of the janitor's apartments, which have a kitchen sink and washtubs with marble panels and safes, one toilet-room containing urinal and water-closet, another containing bathtub and water-closet, another with a sink only and two washbasins. All the water pipes are brass, and where exposed are polished and lacquered. PLUMBING IN THE BANK OF AMERICA BUILDING, NEW YORK CITY. There are 20 lines of soil, waste, and vent pipes from 3 to 6 inches in diameter, and rising to about 150 feet above their lowest points. 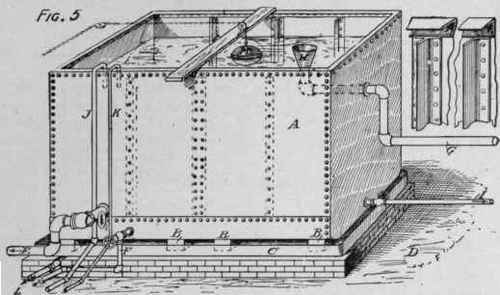 These lines were all filled to the top with water, and it is stated that no leaks were found, and the water did not settle perceptibly in any of them during the five or ten hours' test. In the eighth-floor toilet-room. 16x20 feet, it was necessary to crowd in 16 water closets, four urinals, two washbasins, and a slopsink. 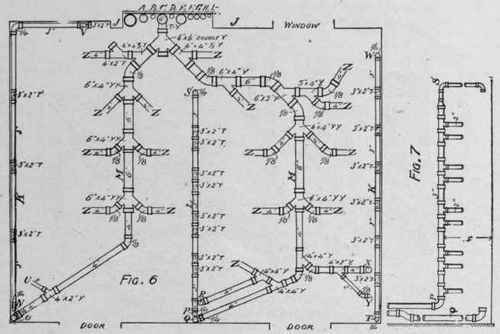 The complicated arrangement of soil and vent pipes used here is shown in diagrams, Figs. 6 and 7. J J is a pipe shaft containing all the rising lines, A is a 4-inch vent pipe from lower floors, B is the gas main, C the main soil pipe, D is a 1½-inch hot-water pipe from the basement boiler, and is continued to open above the roof tank, E is a 6 inch rainwater leader, F is the 2-inch pump pipe to tank, G is the 2-inch supply pipe from tank, H is the 2-inch drip pipe from tank safe and lower safes, I is the 1-inch hot-water return-circulation pipe. The soil pipe C extends above the roof, and its main branches, M and M, connect at O and Q with vertical pipes extending above the roof. K, L, and K are the trap vent pipes and rise above the roof from points N, P, and T. At each tee and at S. V, and W a 2-inch lead branch connects with the trap of the corresponding fixture. At Z Z, etc. are water-closets, at X a slopsink, at Y two washbowls, and at U four urinals. The lines M and M are laid beneath the floor tiles. The vent lines, K and K, are behind the wainscot, and L is concealed in a fireproof partition that crosses the room. The walls and ceiling of this room are plastered and tinted, the floor tiles, wainscot, and other panels are of Italian marble, and the cabinet-work (which is all elevated from the floor) is of oil-finished oak. The shaft J J is faced inside with glazed brick, and to avoid defacing these two special iron supports, shown in Fig. 8, were built in the first or bank story, and one in each of the other stories, to carry the rising lines of pipes. Figure 9 shows different methods of supporting the pipes from the iron floor beams. Figure 7 is an elevation of vent pipe L in Fig. 6.